People follow below two methods to put molding. You can setup trolley and track to bring concrete mixture at the time of molding. This will be more useful if your molding area is more. You can finish your work fast. You can make beautiful designs for roof. Because once molding base is ready you need to put soil. Once soil is filled you need to prepare surface with cement. Once surface is done it has to be dried out for one/two days. You can’t setup track to bring concrete mixture. Since track legs will go inside soil and roof base will get spoiled. So until roof, you can use lift to bring concrete mixture from down then you need to use manual labor. Manual labor disadvantages while molding: earlier people were using manual labor to put molding. Concrete has to me mixed with appropriate water. Once water is mixed, labors carry cement mixture and put in roof.During this process concrete mixture will get spilled on them. 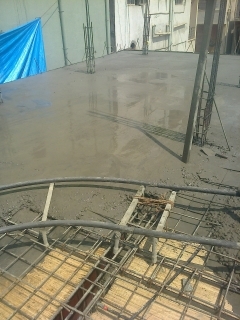 So to avoid that labours will not mix more water to avoid spilling which will damage quality of the molding So I suggest you to use lift/machinery to bring concrete mixture to the roof and from there use trolley to pour mixed concrete o slab. Where ever is possible use machines instead of manual labour. Get feedback from others before giving work to molding mason. Concrete mixture from branded companies: Before ordering concrete mixture, from branded company visit company mixing plant to check whether they are using good sand or not. If they are using filter sand then it won’t be worth to take from mixing companies.